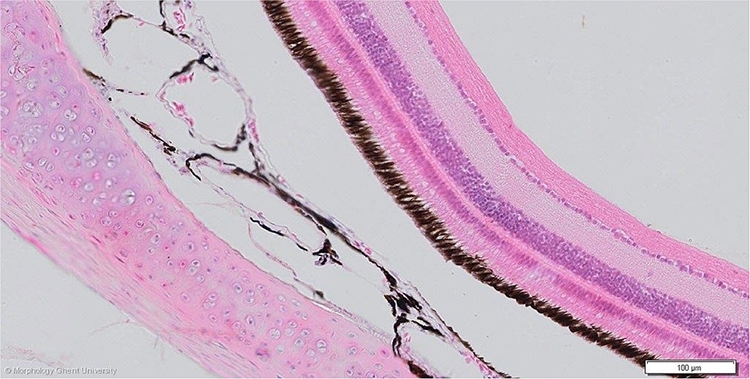 The wall of the eye is composed of three layers: the tunica externa/ tunica fibrosa (cornea and sclera), the tunica media (uvea) and the tunica interna (retina). The tunica fibrosa can be divided in the anterior cornea and posterior sclera and is responsible for maintaining the shape of the eye. The uvea consists of the choroid, the ciliary body and the iris. A tapetum cellulosum is only present in some nocturnal species as the nightjar (Caprimulgus spp). The retina of birds is composed of 10 layers, as in mammals. In contrast to mammals, the avian retina is avascular.